Back on Oct. 30, 2007, in a story about that night’s Democratic debate, NBC anchor Brian Williams raised what he saw as a crucial issue in that primary battle. Barack Obama had vowed “to be tougher in the campaign against frontrunner Senator Hillary Rodham Clinton?” Could he make good? Clinton turned back the clock on the media narrative for the Democrats last week. For several weeks running, the press had cast Obama as a clear frontrunner, one perhaps on the verge of finishing off his rival. Almost instantly after Texas and Ohio, that narrative returned to where it was through the decidedly mixed Feb. 5 Super Tuesday results—speculating about a hopelessly deadlocked contest decided by superdelegates. And embedded in that in the media coverage last week was a months-old question: Was Obama “tough” enough to win a nomination fight with a determined foe. In many ways, even in a strong week for Clinton, the narrative turned on questions about Obama. As a significant or dominant newsmaker in 60% of campaign stories, Clinton narrowly won the competition for media exposure from March 3-9, a period that began a day before the Texas, Ohio, Vermont and Rhode Island primaries and ended a day after the Wyoming caucus. For Clinton—credited with engineering another comeback in this roller coaster race by aggressively attacking Obama—that was her highest level of 2008 coverage. At 58%, Obama dropped 11 points from the previous week. And in a difficult stretch of coverage, he found himself facing questions about the need to make strategic and tactical changes in his campaign. In the week that the GOP race was formally decided, the Democrats dominated coverage over the Republicans by the lopsided margin of about four-to-one (70% to 18%), a margin similar to the week before. Speaking of not making news, in what was arguably his wife’s most important campaign week, Bill Clinton (at a mere 1%) continued to be conspicuously MIA in the media. 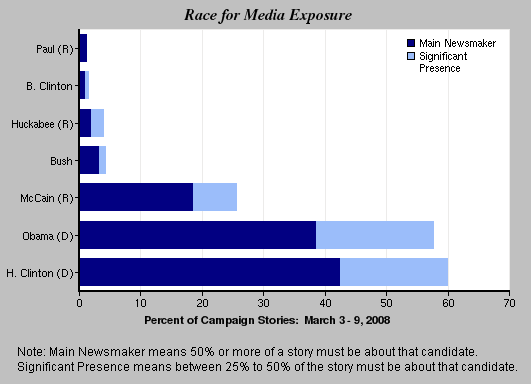 The campaign had one of its more dominant weeks in the press in 2008. Despite a crowded news menu that included renewed Mideast violence, a new Russian president, and a torrent of bad economic news, it filled 52% of the newshole for March 3-9, according to the PEJ’s News Coverage Index, an increase of nearly 40% from the previous week’s total. In cable, a whopping 77% of the airtime studied last week was devoted to the race for the White House. The verdict on her victories in Ohio, Texas and Rhode Island was swift, given how close to political death she was considered only a week earlier. “Going negative proved positive in comeback,” The Los Angeles Times headline read the next day. Clinton’s “new voice was angrier, sharper and far more negative toward Obama,” declared the story, which also cited her controversial “3 a.m.” ad questioning Obama’s crisis credentials. In the run up to the March 4 contests, the media story line already had Obama on the defensive. “Barack Obama under a barrage of questions and political attacks” declared CNN’s Wolf Blitzer on March 3. With two weeks between primaries, the press also had more time than before to dig into some of the accusations between the candidates. By the eve of the March 4 contests, journalists were focused intently on the Illinois Senator’s ties to Chicago businessman Tony Rezko, who went on trial March 3. The media also homed in on a controversy over whether an Obama advisor had assured a Canadian official that the candidate’s hard line on NAFTA was largely for political consumption. After the results were in, as a March 5 NBC Nightly News report noted, Obama pointed a finger of blame at the media, telling reporters on his plane that Clinton’s “complaining about the refs apparently worked a little bit this week.” But while Obama was criticizing the media, David Gergen was reprising an old, nagging doubt about the candidate and the t-word—toughness. Some of that aggression seemed to backfire when Obama’s foreign policy advisor Samantha Power resigned on March 7 after calling Clinton a “monster” in a newspaper interview. To cap off a rough week in the media, Obama’s March 8 caucus victory in Wyoming generated minimal bounce. The lead paragraph of the March 9 Washington Post front-page campaign story reported that Clinton’s March 4 wins “appears to have convinced a sizable number of uncommitted Democratic superdelegates to wait until the end of the primaries and caucuses before picking a candidate,” a development that would stanch the recent flow of delegates to Obama. Conversely, Obama’s 23-point win in Wyoming was relegated to the fourth paragraph of the story. Last week’s campaign coverage overshadowed a number of stories with potentially far-reaching implications. The second-biggest story, according to the News Coverage Index for March 3-9, was the U.S. economy. But it registered at only 7% in a week when home foreclosures broke new records, and when it was announced that the country suffered 63,000 lost jobs in February. Next came Israeli-Palestinian tensions (4%), at a time when Gaza fighting left more than 100 Palestinians dead and an attack on a Jewish seminary in Jerusalem claimed eight lives. The small blast at a Manhattan military recruiting station was next at 2%, followed by the ascension of Dmitri Medvedev—Vladimir Putin’s handpicked successor as Russian President—also at 2%.